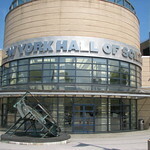 Built initially as a pavilion for the 1964 World's Fair, the New York Hall of Science is now New York City's hands-on science and technology center. Since 1986, NYSCI has served more than five million children, parents and teachers. NYSCI's mission is to convey the excitement and understanding of science and technology to children, families, teachers and others by galvanizing their curiosity and offering them creative, participatory ways to learn. NYSCI features the largest collection of hands-on science exhibits in New York City. Visitors of all ages can explore over 450 interactive exhibits. Closed Labor Day, Thanksgiving Day and Christmas Day.